Rookie defenseman David Warsofsky is trying to become the ninth member of Boston University's 2009 NCAA National Championship team to make the NHL. The fact that he'll have to do it by earning a spot on the defending Stanley Cup champs makes the assignment a lot tougher. Warsofsky is trying to join a list of former teammates who have already cracked the NHL that includes Colin Wilson (Nashville), Nick Bonino (Anaheim), Brandon Yip (Colorado), Matt Gilroy (Tampa Bay), Colby Cohen (Boston), John McCarthy (San Jose), Kevin Shattenkirk (St. Louis) and Brian Strait (Pittsburgh). But the task ahead of Warsofsky is more difficult than most -- the Bruins have almost everyone back from the team that beat Vancouver for the Cup last spring. "It's obviously not going to be easy," he told NHL.com. While Warsofsky is realistic about his chances of cracking the roster of the defending champs in his first full season after turning pro, he hasn't given up hope -- and doing so would be extra special for the 21-year-old defenseman, who grew up just 30 minutes south of Boston in Marshfield, Mass., and stayed local by playing his college hockey at B.U., a school that has produced dozens of NHL players. There's no question as to Warsofsky's skill. In three seasons with the Terriers, Warsofsky played 113 games, scored 22 goals and added 46 assists for 68 points, along with a plus-32 rating. He was 3-20-23 as a freshman in 2008-09, when the Terriers won the fifth national championship in school history. He had 12 goals and 23 points as a sophomore, then went 7-15-22 last season before turning pro after B.U. was eliminated from the Hockey East playoffs. He didn't look out of place after turning pro; in 10 games with Providence, the Bruins' AHL farm team, he had three assists and was plus-3. One of Warsofsky's most memorable moments at B.U. came when he scored the opening goal in the Terriers' outdoor game against archrival Boston College at Fenway Park on Jan. 8, 2010. Warsofsky rifled a shot from the point that trickled through goalie John Muse's five-hole. Following the power-play tally, Warsofsky famously celebrated by "swinging for the fences." "It's not many times you get to play in an outdoor game, especially at Fenway Park, and I was lucky enough to score," Warsofsky said. "I did a little celebration, but it was all in fun." Warsofsky was drafted in the fourth round (No. 95) by the St. Louis Blues in 2008 -- but was thrilled when the Blues traded him to the Bruins for Vladimir Sobotka on June 26, 2010. "I was kind of in shock," Warsofsky said of the deal. "It was pretty unexpected for me, so, when I got the call I was obviously excited and I was eager to get going in the Bruins organization." The trade positioned Warsofsky with the rare opportunity to play for the team he grew up watching -- Hall of Famer Ray Bourque was his boyhood hero. Like Bourque, Warsofsky is a dynamic, puck-moving defenseman who's less than six feet tall. 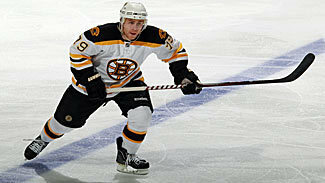 But while Bourque was 5-11 and well over 200 pounds, Warsofsky is listed at 5-foot-8 and 170 pounds. "It's something I've had to deal with my whole career," Warsofsky said of his size. "I just use that as motivation to get better and prove everyone wrong." If Warsofsky's lack of size is a detriment to his game, it's impossible to tell by the way he performs on the ice. He is a powerful skater and has a keen sense for the game -- vital attributes for someone who's not going to knock a lot of guys off the puck. "Obviously (Warsofsky) is a little smaller than average defenseman, but you wouldn't notice by his points," fellow Bruins defensive prospect Zach McKelvie said. "He's obviously a really skilled defenseman, he moves the puck really well and he has an element of grit to his game." He also brings an element of leadership. Warsofsky captained the USA U-18 National team in 2007-08 at the World Championships. He was also awarded the "C" at the second of Boston's two rookie exhibition games against the New York Islanders this week. "Any time you're a leader on a team, you want to bring it up to the next level in everything you play for. So I try to be a leader wherever I go," Warsofsky said. Warsofsky had a goal and a pair of assists in the first of the two games, an 8-5 Boston win. He didn't hit the scoresheet in Tuesday's rematch, a 7-2 loss, but he was one of the most visible players on the ice. "I think he was our best defenseman (Monday)," Providence coach Bruce Cassidy said. "He's real smooth, good with the puck, makes good decisions, and sees the ice … right now he's a legitimate prospect." While Warsofsky hopes to be the ninth 2008-09 B.U. alum to make the NHL -- and the first Massachusetts native to wear a Bruins uniform since Bobby Allen in 2007-08, he knows it's not going to be easy -- and that he has a lot to learn. 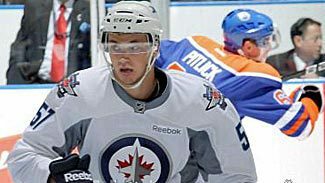 "Until you make it to the NHL you can obviously get better," Warsofsky said. "And even then, you can always get better every single day. I'm just trying to improve every day."